ATTN: 2019 travel tryouts start April 29th! Find your child's tryout dates, or pre-register now. *Practices for Fall 2019 soccer begin early August for Academy/Rec. To find out when practices begin, where they are held, game schedules, etc. please review the FAQs. Please note: this year the Academy/Rec will have games Columbus Day Weekend and games will start Labor Day Weekend. If you plan to volunteer for 2019, you will NEED to complete a background check in accordance with the Carroll County Rec And Parks Policy. GET A HEAD START - DO IT NOW! Thank you for visiting the Westminster Soccer Association web site. WSA provides the opportunity for players of all skill levels to develop their soccer, social and sportsmanship skills. We offer the WSA Soccer Academy for ages 4 thru 7, Co-ed In-house leagues for 3rd grade thru 9th grade, and travel teams for age groups U-8 thru High School. Check this website regularly for updates, meeting notices, weather cancellations, game schedules and more. Should you have any questions or concerns, contact information is listed above and on the board member page. Free Spring 2019 Skills Clinics - Sign Up Now! 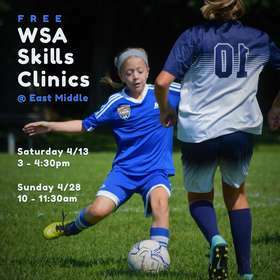 The Westminster Soccer Association will host two free skills clinics in April for girls and boys born in the years 2004 through 2012 at East Middle School. RSVP soon at bit.ly/rsvp-wsa-skills to let us know if your child is joining us for one or both days. WSA travel soccer coaches will lead this free, fun, and low-key clinic that focus on developing passing, receiving, and dribbling skills. The clinic is open to all levels of soccer players, including new players who want to give soccer a try! The clinic is also a great opportunity for anyone interested in playing travel soccer next year to get to know a bit more about WSA’s travel program. WSA travel coaching staff will give an overview of the travel program and field questions from parents following the session. You may email the clinic’s coordinator, Tara Schoberg, with questions at tschoberg@hotmail.com.